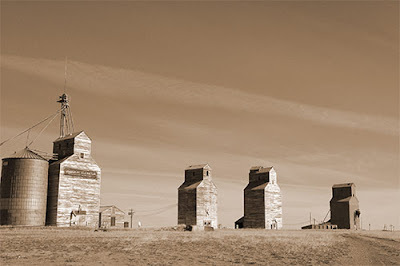 Flickr has a group called "I Love Grain Elevators". It has nearly 5000 photos. There's also an organization, based here in Bozeman, called the "Country Grain Elevator Historical Society." The guy who founded it is one of the finest photographers I've ever seen. The most interesting collection of grain elevators has to be in nearby Alberta, where, at one time, the Alberta Wheat Pool elevators were painted in various pastel shades of green, blue, and orange, with some other elevators in red, yellow, brown, etc. Truly the most colorful in North America....but they're slowing coming down, too. Yeah, while I've spent much less time wandering around Alberta than Montana, I've spent some time in the prairies there, and enjoyed photographing the elevators. There's something about the Alberta prairie landscape that's definitely very evocative to me ... the towns are often more picturesque, somehow, as if stepping back in time just a little ways.